So You Think You Can Mom? : Big Bad Beetleborgs on DVD! Big Bad Beetleborgs on DVD! Premiered in 1996, popular weekly kids series Big Bad Beetleborgs follows the exciting adventures of three ordinary kids Drew, Jo and Roland as they enter the supposedly haunted mansion after accepting a dare. Their lives changed forever when a magical spirit grants them their biggest wish – they get to find out what life is like as their favorite super heroes the Beetleborgs! Fans of this memorable 90’s live-action series rejoice when Saban’s Big Bad Beetleborgs: Season One, Volume One 3-DVD set hits home entertainment shelves everywhere on October 16, 2012 from Shout! Factory, in collaboration with Saban Brands. Featuring the first 27 fun-filled episodes from the first season, this DVD release has long been anticipated by fans. 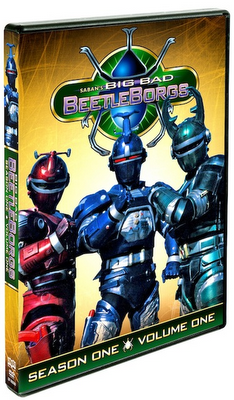 The collectible Saban’s Big Bad Beetleborgs: Season One, Volume One DVD set is priced to own with a suggested retail price of $19.93. When three kids explore Charterville’s haunted Hillhurst Mansion on a dare, they discover a lot more than they bargain for! The trio find a wild and wacky phasm named Flabber, who changes their lives forever when he grants their wish tobecome the superheroes they’ve read about in BeetleBorgs comics. However, not only does Flabber grant the kids’ wish, but he also accidentally facilitates the escape of supervillain Vexor and his evil gang of Magnavors from the comic book as well! Now it’s up to these three newly tapped superheroes — aided by a friendly neighborhood phasm and armed with fantastic powers and awesome vehicles — to save the world from the forces of darkness that threaten the peace and harmony of all mankind. This is one of my kid's most favorite shows! They sing the theme song over and over again. Now, thanks to Shout! Factory, we can watch it ALL THE TIME!! !